By the way, 2fort servers #04 (and sometimes #05 and #18) have been regularly starting up most evenings, usually around 6PM EST/3 PM PST, and are active for a few hours. 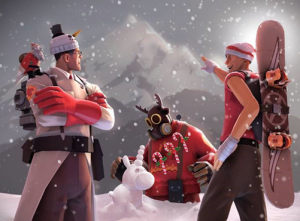 If you’re looking for some 2Fort action without hackers or grossly unbalanced teams, just type “connect server4.tf2newbs.com” into your console; no password required. Meanwhile, the ever-expanding adventures of the Newbs’ XCOM 2 saga can be found on our forums. Read up while you’re powering through all that fruitcake. Speaking of fruitcake, server admin Packhead is streaming free Christmas music! Find that link on our forums as well. The Steam Winter Holiday Sale started today! No new contracts, maps, or weapons this season. Definitely a simpler update this holiday season. Logging in to TF2 during this event scores you a Gift-Stuffed Stocking tool item. If used, it contains 2-3 random weapons, paint can, name tag, description tag, backpack expander, giftapult, and occasionally other random items such as cosmetics. These items are untradeable. The keyless Winter 2016 Cosmetic Crate drops new community-made cosmetics. Instead of buying a key and dropping/buying a crate, you just buy the unlocked crate. Crates don’t expire, but they can only be bought for a short time. Crates have a chance of also dropping a Festivizer tool that makes an item festive. Festivizers now work on more items. Mann Co. Store is having a 20%-75% off sale, highlighting tools and cosmetics. Sale now thru January 11th. Valve Winter Sale hasn’t started… yet. Players are automatically formed into a rematch with the same teams of players. Server then prompts map vote of current map or two others, based on searched maps of player prior to match. Casual now has a new, voluntary version of the old autobalance system. During a match, you may be prompted to switch sides if teams become unbalanced because of players leaving games. If you volunteer, you will earn bonus XP during the match; you are not required to switch, and no one will be forced to switch sides. Also, you can now set a maximum accepting ping for Comp or Casual matches but selecting the gear icon in the Matchmaking lobby. As always, full patch notes courtesy of the excellent Official TF2 Wiki. New weapons for the Festivizer! There are 3 maps to vote on, chosen based on the maps everyone in the match had selected when they began searching for a match. The current map is always the first option. New autobalance system to help with balancing teams when players leave a match. The system will ask players to volunteer to switch teams.